07 April; Dubai, Seabourn Ovation. There was a reason for me having been vague a week ago about my next ship, as the Seabourn Ships are hard to visit. First of all they are often off the beaten track and their embarkation ports often require Visas, either as guest or as crew, or for both. Applying for a Visa takes more than a few days and that brings a un-necessary complication to my activities so I try to avoid it. Secondly Seabourn is very successful and thus the ships are always sold out and often it needs a last minute cancellation to get a function like mine on board. As the ships are smaller, the chance of an empty cabin goes down, and there is also not the option to have a few “extra” cabins on board as there is simply no space. So I assume that my cabin availability is the result of a last minute cancellation although I hope that the underlying reason is not one of great tragedy or illness. But whatever happened it got me on board the ms Seabourn Ovation where I stepped this morning in Dubai. As with all developing cities in the Arabic peninsula, Dubai consists of a gaggle of skyscrapers sitting in a desert of yellow sand. At least that is what you see from the ship. I am not into sand, as I prefer the sea or woodlands so it does not mean much to me but if you are into modern architecture then it is THE place to be. The Seabourn Ovation. The last newbuild of Seabourn Cruises. Dubai is part of the United Arab Emirates or UAE and it grew on the oil industry. As everybody realizes here that there will be a day when all the oil is gone, or replaced to a large extent by alternative energy sources, the local government is developing Tourism as an extra source of income. Hence there is also a cruise terminal with three berths. And as there was nothing before in this area, space was not an issue and as a result it is a very large and beautiful hall which looks more like a Hotel lobby than a large cavern of a depressing luggage shed which a lot of other terminals resemble, especially on the disembarkation side from where you collect your luggage. The re-positioning cruise of the Seabourn Ovation. For those interested the ship will be doing a similar one next year, but starting on April 04. 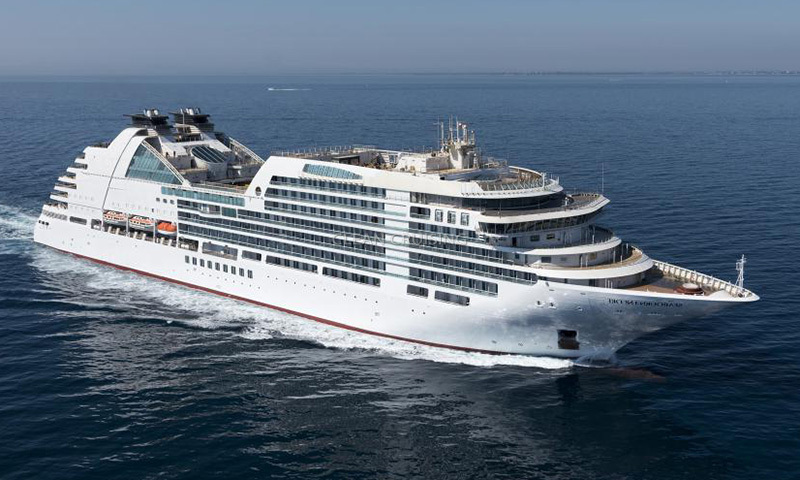 The good ship Seabourn Ovation is on a re-positioning cruise from The Far East to the Mediterranean and will now make a 3 week cruise from Dubai to Piraeus. One of the highlights is transiting the Suez Canal which is totally different to the Panama Canal. The Suez Canal name is really wrong as there are no locks so it is not a Canal. It is a man made channel dug through the desert. But more about that in the future. 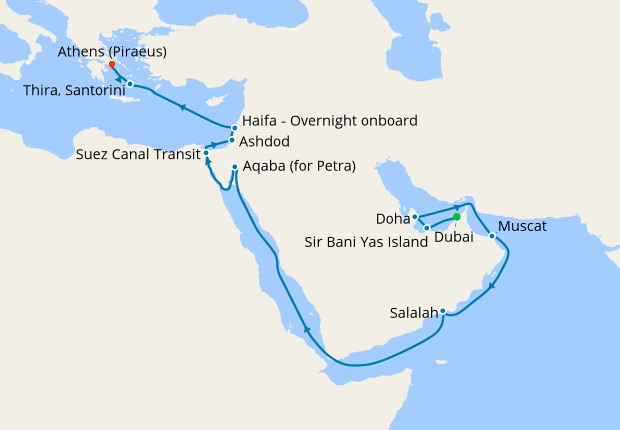 The ship will call at various Arabic countries, followed by Israel and then followed by Santorini which is a Greek Island. 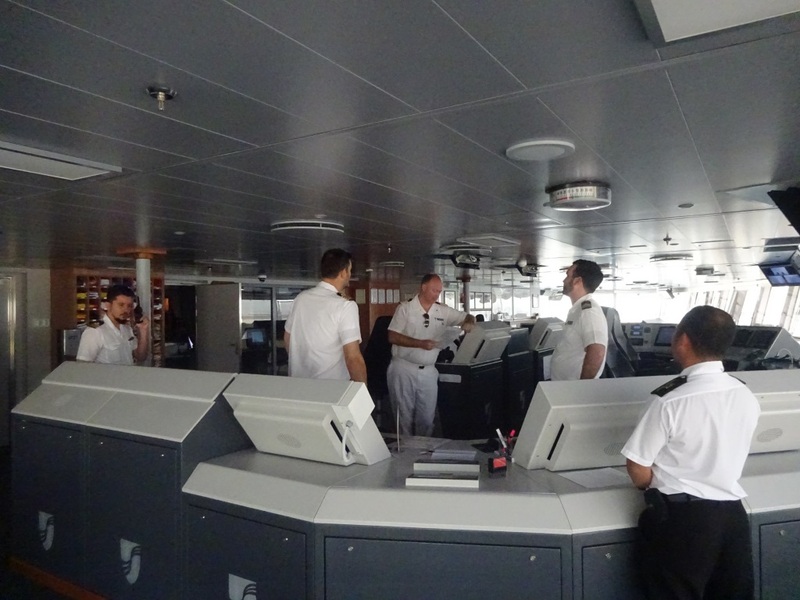 Captain Stig Betten, center, briefing his navigation team just before departure. In charge of the good ship Seabourn Ovation is Captain Stig Betten who is Norwegian. He heads a very multinational crew which also includes some Holland America Line Officers and crew, who were either rotated in or asked for a rotation with the aim to sail on a smaller ship. The Ovation is just off 40000 tons which makes it roughly the same size as the ms Prinsendam which is slightly smaller. The inter connection of crew already indicates that Seabourn is closely related to Holland America and in some ways considered a daughter company of subsidiary. The product is of course very different but the running of the operational aspects is quite closely aligned, especially where Deck and Engine are considered. And that is where I come into the picture; as due to this alignment the support program I run can be of use to the Captains of the Seabourn Ships as well. Hence a regular 3 week visit to the Ovation in a similar way I visit the HAL ships. While sailing out we saw an old friend. The QE2 from Cunard. Now a hotel in Dubai and reduced to a static role minus lifeboats. In the back the all around present of skyscrapers, more skyscrapers and even more under construction. Thus at 1700 hrs. 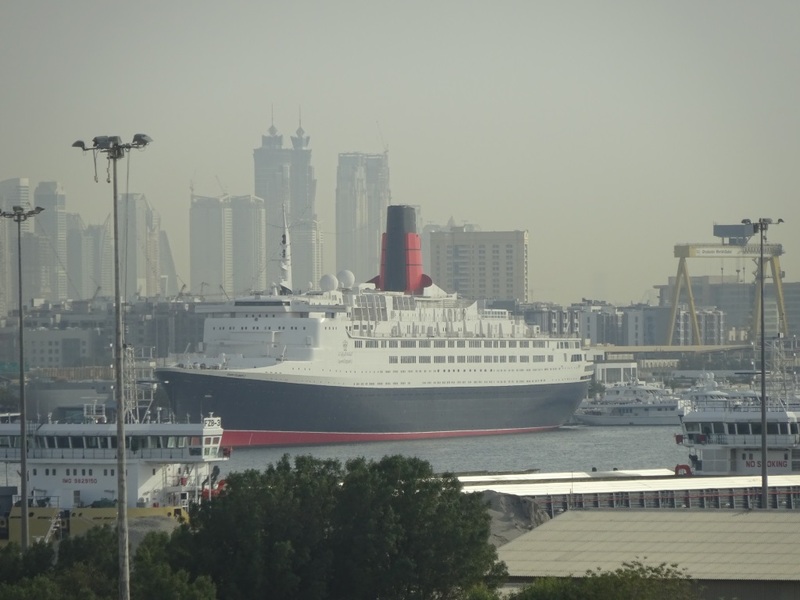 the Ovation departed from the berth and sailed out of Dubai harbor. First stop tomorrow is an island just down the coast, Sir Bani Yas Island. The good news is the anchorage is in a sort of bay surrounded by shallows and islands. The bad news is, the northerly wind coming from over the sea can breeze up here to 50 knots without much notice, and that wind can make things quite choppy at the tender platform. Weather at Sir Bani Yas, sunny and warm 31oC – 87oF. Wind is an unknown factor as the three forecasts used on the bridge all give something different. I hope there will not be too much rain as that is not good for the tender service but also because the ship is planning a beach barbecue. 25 March 2019; At Sea. 08 April 2019; Sir Bani Yas Island. Welcome back. The next few days should be interesting reading for those of us who follow you around the world. It’s great to have you back online blogging! Your posts to be very informative….and I appreciate your subtle sense of humor. Wow! Captain Albert, you do get around. Very much looking forward to this trip with you. Seems very exciting and interesting. Thanks for taking the time to write to us. Yes, I’m looking forward to the exploits of this cruise. Thank you for this. Captain, did you end up with one of the “luxury” suites? If you mean the “owners suite” no, I did not, but I have a nice balcony cabin on deck 7 forward. Normal policy is, when a top of the range cabin becomes available due to a cancellation, to start bumping up guests with an upgrade and then the standard cabin left becomes mine. Still I am NOT complaining……………. I assume I can speak for many that we are all ready to follows your next adventures by reading your blogs–always very enjoyable and informative. I truly enjoy all that you are telling us about the sailing life and the most interesting behind the scenes stories. I have gained such respect for all that goes into what it means to sail a ship.